Heat oven to 350° F. Spray cookie sheets with cooking spray. In large bowl, mix cookie ingredients with spoon until blended. Drop dough by rounded measuring tablespoonfuls about 2 inches apart onto cookie sheets. Bake 10 to 12 minutes or until set. Cool 2 minutes; remove from cookie sheet to cooling rack. Cool 10 minutes before glazing. In small bowl, mix powdered sugar and cinnamon. Stir in milk until smooth. If necessary, add additional milk 1 teaspoon at a time, until glaze reaches drizzling consistency. Drizzle cookies with glaze. Always read labels to make sure each recipe ingredient is gluten free. Products and ingredient sources can change. To make drop cookies uniform in size, use a small spring-handled ice-cream scoop available at most grocery and discount stores. 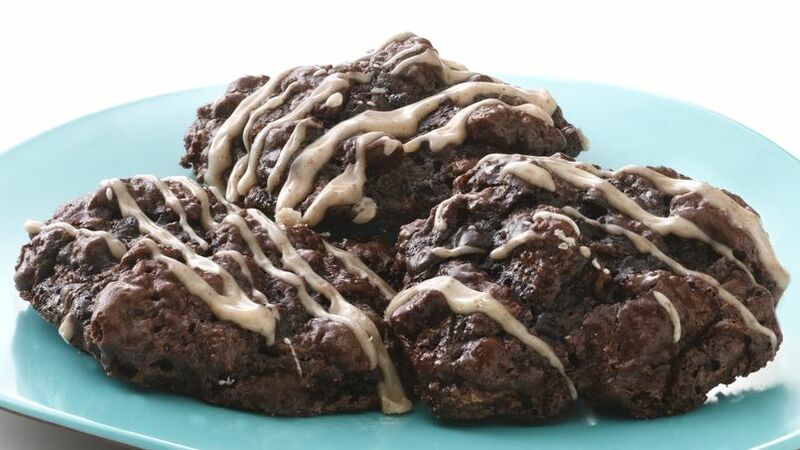 Eat a great-tasting fudgy cookie with a cinnamon twist made with brownie mix and cereal.